March Madness: Keeping Society Sane Since 1908 Think you know your NCAA tournament facts? Try these on for size: What are the odds of a perfect bracket? What surgery is performed more frequently during the madness? 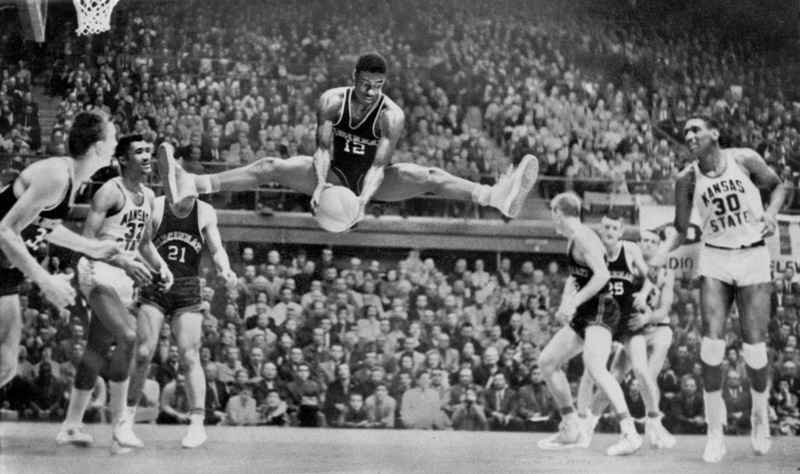 Oscar Robertson, Cincinnati's All-American Star, is seen mid-air after a rebound catch during the NCAA regional elimination game in Manhattan, Kan., in March 1959. On Sunday, the top 68 collegiate teams will be selected to play in the annual NCAA basketball tournament. Brackets will be filled, hashtags worn out and betting money will be (illegally) lost. But the "March Madness" phenomenon has evolved quickly and into a different format than it originated. All along though, it's the fans who've charged the tradition. "A little March madness may complement and contribute to sanity and help keep society on an even keel." The original March Madness started in 1908 with a boys' high school basketball tournament in Illinois put together by the Illinois High School Association. Before the escalating power of broadcast, Twitter and before the NCAA adopted the namesake, a handful of teams from Kentucky high schools called the "Sweet Sixteen" drew sold out crowds to IHSA championship games. The number of teams participating in ISHA's annual March Madness tournament grew to 900 by the late 1930s. A little March madness may complement and contribute to sanity and help keep society on an even keel. Newspapers ran with the term during the annual tournament's "Golden Era" in the 1940s and '50s. 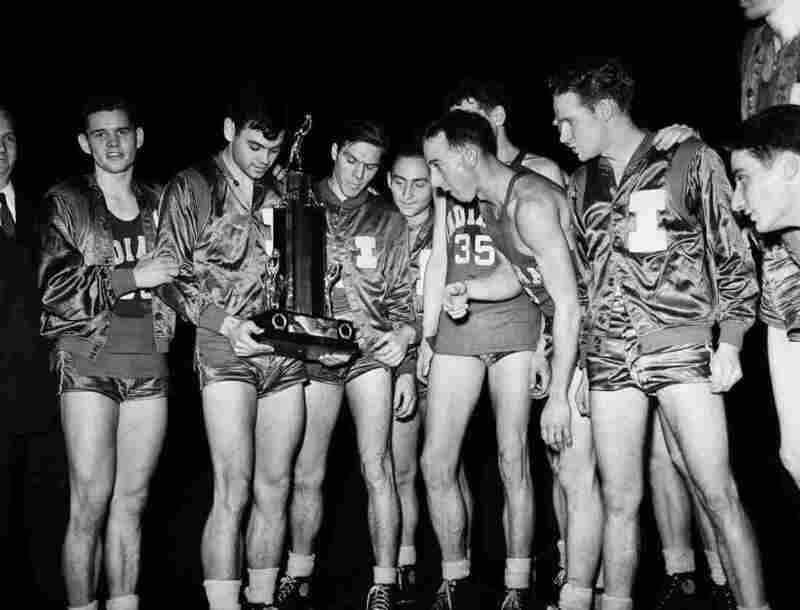 Despite enduring team rivalries, March Madness excitement unified Illinois and other states it permeated as WWII began — eclipsing war drama with local competition of basketball. Marvin Huffman, senior guard and captain of the Indiana University basketball team, (second from left), after winning the tournament on, March 31, 1940, Kansas City, Mo. Huffman was named most valuable player after his team defeated Kansas for the NCAA title. Once again, Porter took to Illinois Interscholastic in March 1942 to commemorate the tournament excitement with a poem entitled "Basketball Ides Of March." He might as well be talking about this week. IHSA trademarked the term in 1989 and still owns the branding on the high school level. After contentious legal battles, the NCAA acquired a license in 1996 to use "March Madness" after CBS sportscaster Brent Musburger first uttered the term during the NCAA tournament coverage in the late 1980s. Duke University vs. UNC-Chapel Hill is arguably the most recognized rivalry in college basketball. Only 11 miles apart from each other, the schools both bring rich histories, iconic coaches and a number of consecutive Atlantic Coast Conference titles. 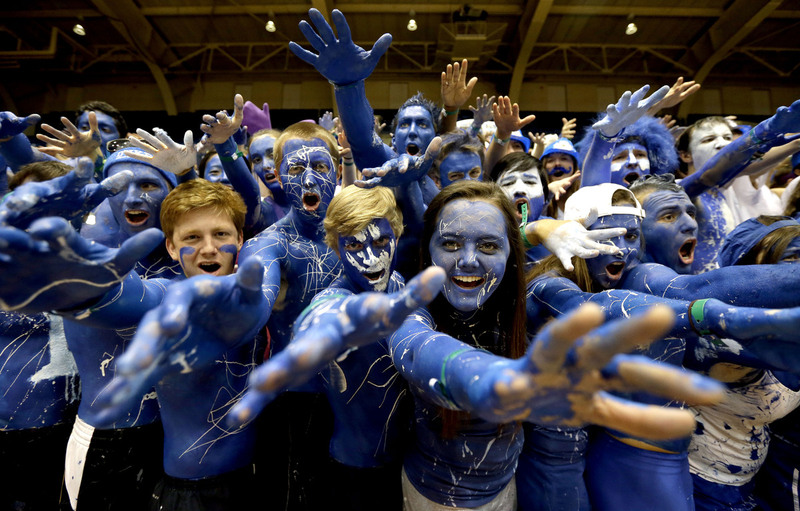 Duke fans cheer prior to the tip-off between Duke and North Carolina in an NCAA college basketball game in Durham, N.C., on March 8, 2014. Last week, ESPN Films released six documentary shorts directed by Errol Morris for the "It's Not Crazy, It's Sports" series. The plot of one short involves an unidentified group of Duke diehards who stole a replica of Michael Jordan's retired UNC jersey from the university dome's rafters in 1998. Meanwhile, a newspaper headline on the infamous UNC-Duke rivalry read, "Fans' Feud Not Shared By Players." Between the two, UNC leads the series 133-107. You don't have to know college basketball to fill out a bracket. The unpredictability is what keeps such a widespread viewership invested in the frenzy. The odds of picking a perfect bracket are 1 in 9.2 quintillion anyway, according to USA Today. Warren Buffett probably knew something about these odds when he teamed up with Quicken Loans last year for a contest that boasted a $1 billion reward to a perfect bracket. The number of people filling out brackets only continues to grow. This year, American Gaming Association projects that 40 million Americans will fill out more than 70 million brackets — that's more brackets completed than ballots cast for President Obama in the 2012 election. And if tradition tells us anything, Obama will share his bracket picks this week for both the women's and men's NCAA tournament, for the seventh year in a row. The hype around the Division I games have spawned new species of "March Madness." You can now root for your favorite underdog mammal or musician. Or you might opt to revive the alternative "The Most Hated College Basketball Player of the Past 30 Years" or Shakespearean plays bracket. More than a few men have found creative ways to get out of work and watch the series. The month of March sees a surge in the number of men getting vasectomies. Urologists reported a national increase of up to 50 percent in the number of vasectomies scheduled on the days preceding the tournament. Before apps, hashtags or push notifications, in the 1980s, desperate fans could to call in to a sports hotline to get score results. Today, there are almost too many ways to follow the madness. Social media makes it easier to document sports history and cure our fear of missing out, or FOMO. NCAA recently revamped their March Madness app design with new features, including game highlights, more seamless bracket picking and in-depth team background pages. USA Today's new app wants to cater to our FOMO. It plans to help us manage our sports-watching decision making by sending notifications on where to watch and when as well as offering need-to-know storylines throughout the series. So whether it's numbats or college basketballers, it's clear that we love a good competition.